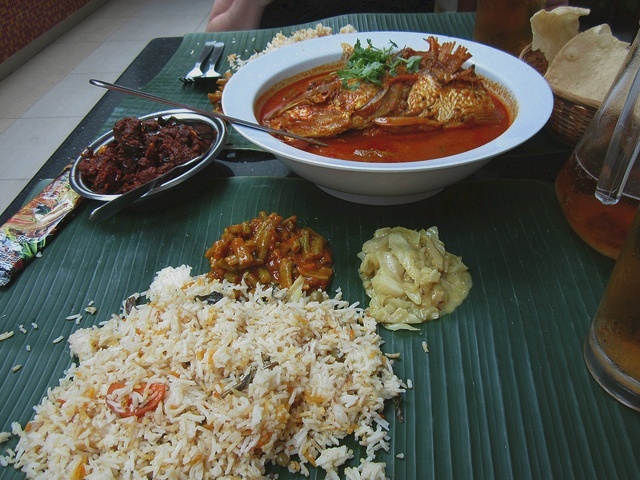 In Singapore, Indian dishes is characterized by its complex use of spices, which is used to make its staple curries. Generally, Indian dishes is not as hot and spicy as thought by most people. It can even be thought of as delicate in flavoring. The best place to try Indian cuisine is in Little India. There are several northern and southern Indian eateries there. Indian food can also be found at hawker centers and food courts. Indian Dishes Recipe – Crispy pan fried "pancakes" made from wheat flour, water and butter (or ghee). Accompanied by fish or chicken curry. A common dish eaten as breakfast or supper. Number 1 dish loved by all Singaporeans! Indian Dishes Recipe – Flour based batters deep fried until crispy. Some batters are plain or with eggs and fish cake. Served with a red sauce that is non-spicy and sweet. Indian Dishes Recipe – Roti John, essentially an omelette sandwich, is a popular Malay breakfast and snack item in Malaysia and Singapore. Indian Dishes Recipe – Pancake made from rice flour and coconut milk. Eaten with sugar or curry. Indian Dishes Recipe – It is a huge prata wrap with seasoned or grilled chicken or mutton (lamb) and onion. Indian Dishes Recipe – A bread that looks like weaved thin rice noodles. Indian Dishes Recipe – One of the highlights of northern Indian cuisine is food that is baked in a tandoori or clay oven. Wheat based breads, such as Chapati and tandoori baked Naan also originated in the north. Indian Beverage Recipe – Teh tarik (literally pulled tea or ?? in Mandarin) is a hot tea beverage which can be commonly found in restaurants, outdoor stalls and kopi tiams in Malaysia, Singapore and Brunei. Its name is derived from the pouring process of "pulling" the drink during preparation. It is made from black tea and condensed milk. Indian Beverage Recipe Milo Dinasour – Milo is a chocolate flavored drinks served locally in mamak stalls offering versions such as "Milo Dinosaur" (a cup of Milo with an extra spoonful of powdered undissolved Milo added to it). Indian Dishes Recipe – Made from fermented rice flour. This crispy bread is usually eaten with curry, coconut chutney and sambar. A thicken version is called Uthappom. Indian Dishes Recipe – Soaked lentil mixture and deep fried. To be eaten with coconut chutney. Indian Dishes Recipe – An excellent variety of vegetables, savory snacks, lentils and breads have been created, as well as desserts and milk-based sweetmeats. Vegetarian meals, along with a few southern dishes, are often served on a banana leaf. They usually come with a range of vegetables, pickles, chutneys and bread. Indian Dishes Recipe – Raw Basmati rice cooked with spices and meat. The rice will be soft and fragrant as the meat will be tender and juicy. An aromatic dish loved by many. Kentucky Fried Chicken Recipes Revealed? Food and recipe books click hear . I miss Roti Prata, Chicken Curry in Singapore. I used to have a Malaysian Boyfriend in Singapore, and we always go for chicken curry and crispy prata! Oh and the Nasi goreng , I love it too!!!! I miss singpare!!! nice article, i like to read your blog. Spectro Analytical Labs provide Testing Services Labs in India. Is offering all type of Testing services like, food testing, water testing, Environmental Monitoring testing, Non Destructive Testing etc. I am happy to find your blog because I love cooking specially ‘Indian Cooking’ I will love to follow your more recipes. Maybe the best way to learn Indian dishes is by learning with the locals. Thanks for sharing these recipes. Nice blog, it is well written and knowledgeable. I appreciate it. I bookmarked this blog further more information. Recently I eat very tasty and spicy chicken tikkas from Lunch Catering Calgary, i love indian recipies .It is one of my sweet memories of lunch, I can never forget it’s taste.